Designed to reduce back injury and cumulative trauma disorders. Lifts heavy equipment to dynamic working height. Foot pump operated hydraulic pump and lift cylinders. Handle height is 41". All welded steel construction will provide years of service and hard work. 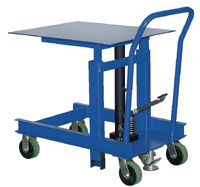 Small frame size allows unit to access hard-to-reach locations. Two rigid and two swivel casters with a floor lock.